Esteemed judge states "Casual yet smart, Sam’s ticks all the right boxes"
Sam's are always interested in recruiting locally. Although they can’t always take on staff without experience, they have had several success stories of local people with no restaurant experience being trained up and becoming senior staff. Sam is happy to hear from possible staff via email on info@samsbrasserie.co.uk or call 020 8987 0555 during office hours. Sam’s Brasserie and Bar in Barley Mow Passage was named ‘Best Local Restaurant’ at the 2006 Time Out Eating & Drinking Awards. Justifiably chuffed with this well earned acclaim, Sam Harrison told ChiswickW4.com "Rufus and I went to the awards at Roast in Borough Market and where completely amazed when our name was read out and we had to go up and except the award. "I am very proud and being voted for in this category is particularly satisfying as I always wanted Sam’s to be a place for locals. I think it really shows the relationships and friendships that we have been able to develop in Chiswick and I am hugely grateful for all the support that we have received." 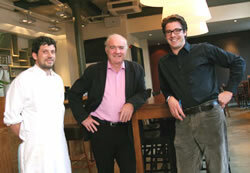 Fellow owner and mentor Rick Stein was also thrilled saying “Brilliant news on the award! Sam's has been open a year and I'm so pleased that his vision of a neighbourhood restaurant has been taken up so enthusiastically by his neighbours in Chiswick and many others from miles around. I never doubted it wouldn't though. Sam’s beat off stiff competition from four other local eateries and was presented with their award by writer, Danny Wallace, at a glittering ceremony attended by over 200 top chefs and restaurateurs, Time Out’s esteemed panel of food and drink experts and a whole host of celebrities including actor Jimi Mistry, comedienne Ronni Ancona, foodie Sophie Conran and renowned designer, John Rocha. Commenting on the award, a Time Out judge had this to say “Locals have taken Sam’s to heart: it was packed on our midweek visit. The lively bar to one side is worth a visit in its own right for decent cocktails and an impressive, globe-trotting wine list that offers plenty of choice for under £20, as well as Krug champagne at £120. The menu mixes brasserie classics with more elaborate dishes. A smoked haddock and cheese omelette with crunchy chips was comfort food of the highest order. Friendly, on-the-ball staff keeps the place ticking over nicely. Casual yet smart, Sam’s ticks all the right boxes”. Each of the ten award winners were chosen from hundreds of nominations received from readers of Time Out and its associated Eating & Drinking Guide. Time Out’s panel of expert judges, including their Food and Drink Editor, Guy Dimond, compiled the final shortlist. Over the last six weeks, each venue has been visited anonymously and judged on a number of criteria such as quality of food and drink, service, ambience and value for money to find the capital’s true winners.